The idea that highly educated people are less religious, on average, than those with less education has been a part of the public discourse for decades, but some scholars of religion have called this notion into question. 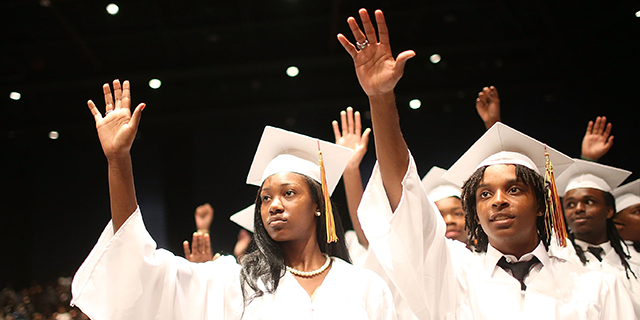 1 And a new analysis of Pew Research Center surveys shows that the relationship between religion and education in the United States is not so simple. On one hand, among U.S. adults overall, higher levels of education are linked with lower levels of religious commitment by some measures, such as belief in God, how often people pray and how important they say religion is to them. On the other hand, Americans with college degrees report attending religious services as often as Americans with less education. This analysis looks at measures of religious identification and commitment among Americans with different levels of education. 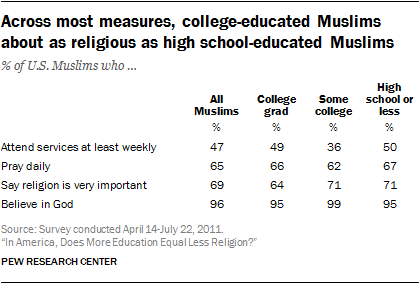 Pew Research Center has previously published data from the opposite perspective, looking at levels of education among people in different religious groups. In the U.S., Hindus and Jews are among the most highly educated religious groups. Worldwide, Jews have the most years of formal schooling. Looking at the U.S. public as a whole, however, the answer to the question of whether more education is correlated with less religion appears to be yes. Among all U.S. adults, college graduates are considerably less likely than those who have less education to say religion is “very important” in their lives: Fewer than half of college graduates (46%) say this, compared with nearly six-in-ten of those with no more than a high school education (58%). Highly educated Americans also are less inclined than others to say they believe in God with absolute certainty and to pray on a daily basis. And, when asked about their religious identity, college graduates are more likely than others to describe themselves as atheists or agnostics (11% of college grads vs. 4% of U.S. adults with a high school education or less). At the same time, Americans with college degrees are no less likely than others to report attending religious services on a weekly basis. Roughly a third of U.S. adults with college degrees (36%) say they attend a house of worship at least weekly, about the same as the share of those with some college (34%) and those with a high school diploma or less education (37%) who say they attend services once a week or more. And while college graduates are more likely than others to describe themselves as atheists or agnostics and less likely to identify with Christianity (64% describe themselves as Christians, compared with 71% of those with some college education and 75% of those with a high school degree or less), they are not, on the whole, much less likely than others to identify with any religion. Indeed, fully three-quarters of college graduates are affiliated with some religion (including 11% who say they are adherents of non-Christian faiths like Judaism, Hinduism, Islam and Buddhism), as are 76% of those with some college experience and 78% of those whose education topped out with high school. In addition, among those who do identify as Christians, college graduates tend to be about as religiously observant as those with less education – and in some cases more so. For instance, more than half of college-educated Christians say they attend religious services on a weekly basis (52%), compared with 45% of Christians with some college experience and 46% of Christians with a high school degree or less. There could be many possible reasons for these patterns, though such explanations are outside the scope of this report. This analysis does not attempt to explain why, for example, Americans with more education are less likely to express belief in God. Nor does it try to explain why college-educated Christians appear to go to church more often than less-educated Christians. The focus here is simply on describing the patterns found in recent Pew Research Center polling, particularly the very large U.S. Religious Landscape Study, which involved interviews with more than 35,000 Americans reached on randomly dialed cellphones and landlines. For ease of presentation, this analysis generally uses three categories of educational attainment, dividing U.S. adults into those who have a college degree, those who have some college (including those with an associate’s degree and those with some community college experience), and those who have only a high school diploma or less (including those with no high school diploma and those who never reached high school). Furthermore, the links between education and religion reported here generally persist in more sophisticated modeling even when other factors that might influence religious belief and practice – such as gender, race, age and religious tradition – are taken into account. The tendency for Christian college graduates to exhibit rates of religious observance that are at least on par with their less highly educated counterparts is evident across a variety of Christian traditions. Among evangelical Protestants, for instance, 87% of college graduates are highly religious, according to the four-item index of religious commitment, as are 83% of those with some college and 82% of evangelicals with a high school diploma or less schooling. Catholics are, on the whole, less religiously observant than evangelicals. But here again, college-educated Catholics exhibit a similar overall level of religiosity (62% highly religious) as Catholics with less education (61% among those with some college, 60% among Catholics with only a high school education). Among Mormons, those who are more highly educated are not simply as religious as those with less education – Mormons with college experience are more religiously observant, on average, than Mormons with less education. Fully 92% of college-educated Mormons are highly religious, as are 91% of Mormons with some college. Among Mormons whose education topped out with high school, however, just 78% score high on the index of religious observance. On other measures of religious observance, college-educated Christians tend to look quite similar to those who haven’t completed college. There are, however, a few exceptions. Among mainline Protestants and Catholics, for instance, those with higher levels of education are slightly less likely to say religion is very important in their lives. And college-educated mainline Protestants are less likely than mainline Protestants who have less formal education to say they believe in God with absolute certainty. While college-educated Christians are about as observant – and sometimes more observant –than Christians with less education, the data show that among the religiously unaffiliated (i.e., those who describe their religious identity as atheist, agnostic or “nothing in particular”), those who have college degrees are considerably less religious than “nones” without a college education. For example, just over a third of religious “nones” who have a high school diploma or less schooling say they believe in God with absolute certainty (36%), compared with just 15% of religiously unaffiliated adults who have completed college. 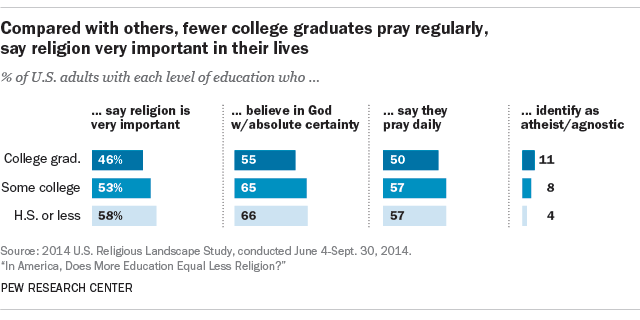 One-quarter of “nones” whose education topped out with high school say they pray every day, which is double the share of college-educated “nones” who say they pray daily (12%). And while 20% of religiously unaffiliated adults with no college experience say religion is very important in their lives, only 6% of college-educated “nones” say the same. These differences are driven partly by Orthodox Jews, who tend to be much more religiously observant and less educated (in terms of number of years of secular schooling) than non-Orthodox Jews. 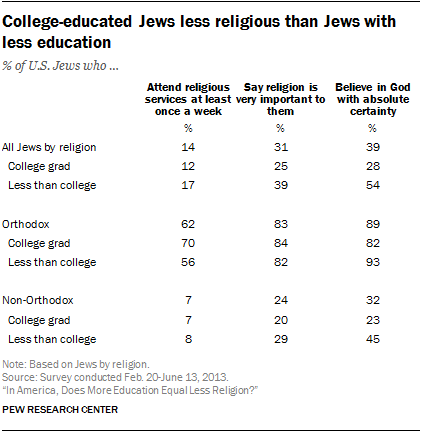 However, even when the analysis is restricted to the non-Orthodox, Jews with college degrees are less likely to say religion is very important to them or that they believe in God with absolute certainty compared with Jews with lower levels of educational attainment. Although U.S. Hindus, Buddhists and other, smaller religious groups are studied in Pew Research Center surveys, including the 2014 Religious Landscape Study, they are not analyzed in this report, for a variety of methodological reasons. Interviews for the Landscape Study were conducted in English and Spanish, effectively excluding members of these religious traditions who speak only Asian languages. Pew Research Center’s 2012 survey of Asian Americans did include interviews in seven Asian languages, but the survey excluded respondents who did not identify as Asian American. Since a considerable share of U.S. Buddhists are not Asian Americans, the Asian Americans study is not able to provide information on the full population of U.S. Buddhists. Hindus are not included in this analysis of religion and education because the vast majority of Hindus in the U.S. have college degrees, and neither the Asian Americans study nor the Religious Landscape Study included enough interviews with Hindus who do not have college degrees to compare U.S. Hindus with different levels of education. Schwadel, Philip. 2011. “The Effects of Education on Americans’ Religious Practices, Beliefs and Affiliations.” Review of Religious Research. Mueller, Charles W., and Weldon T. Johnson. 1975. “Socioeconomic Status and Religious Participation.” American Sociological Review. Goode, Erich. 1966. “Social Class and Church Participation.” American Journal of Sociology. The index is created by combining four individual measures of religious observance – self-assessment of religion’s importance in one’s life, religious attendance, frequency of prayer and belief in God. Respondents are assigned a score of 1 on each of the four measures on which they exhibit a high level of religious observance, a score of 0 on each of the measures on which they exhibit a medium level of religious observance, and a score of -1 on each measure on which they exhibit a low level of religious observance. High religious observance is defined as saying religion is very important in one’s life, attending religious services at least once a week, praying at least once a day, and believing in God with absolute certainty. Medium religious observance is defined as saying religion is somewhat important in one’s life, attending religious services once or twice a month or a few times a year, praying between a few times a week and a few times a month, and believing in God with less than absolute certainty. Respondents are also assigned a medium score on any questions they declined to answer. Low religious observance is defined as saying that religion is “not too” or “not at all” important in one’s life, seldom or never attending religious services, seldom or never praying, and saying that one does not believe in God. The scores for each of these four individual items are then summed; respondents who score a 2 or higher are categorized as “high” on the scale (i.e. they are “highly religious”), those who score between -1 and 1 are categorized as “medium” on the scale, and those scoring -2 and below are categorized as “low” on the scale.